How do I get my wife/partner to ride with me? 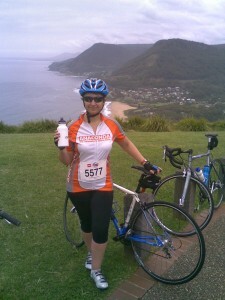 Me on my first Gong ride in 2008. I was really nervous but really loved it. I’ve been asked this question by quite a few of the men who I ride with. They, like me, love cycling so much that they want to share its many benefits with those closest to them. So here’s a few tips that might help. Please excuse the stereotyping and generalising. Women generally approach activities like cycling differently than men. It starts early in life and patterns are set. If you cast your mind back to your childhood you’ll recall that if you were a boy and rode a bike then you probably did some daredevil stuff like riding off jumps or at the least rode around for hours on end with your mates. Girls on the other hand tend to amble along, not ride as far, generally don’t take risks and stop for a chat. Sound familiar? So when adult women start riding a bike again they generally don’t have too many fundamental bike skills other than being able to balance. That was certainly the case with me. As I said, I’m making some generalisations here. So if you’re a man trying to encourage your female partner to ride a bike then you need to be patient and understand that she’s probably not very confident or even competent on the bike. Don’t expect her to want to jump on a road bike, and hit the closest road for a 50 km sprint around the neighbourhood. Let her dictate the pace at which she progresses. For example, if she’s not keen on clip-in shoes to begin with then encourage her, but don’t push her into it. Perhaps it’s better to start with flat pedals and running shoes and progress to clip-ins. But keep that pedal spanner on hand if she changes her mind though. You could do some research and find a local bike skills course. Sometimes these are run by or at least promoted via bike shops. Other times they could be run by bike clubs, cycling groups like Cycling NSW or even local councils. In Canberra, a company called Wheel Action runs regular bike skills sessions. I’ve also been told about bike skills workshops supported by Ashfield Council and run by Donna Meehan of Domestique. Ask other women like me who you already know enjoy riding and ask them what sort of rides they do. You can’t expect a novice rider to want to join your 30 km per hour Sunday coffee ride without at least starting a bit slower and working up to it. I know a group of women who ride together at a much slower pace than my rides and they would always welcome more starters. My partner and I sometimes ride together and sometimes go our separate ways. He rides a lot faster than I do and I think it’s only fair that we meet our own needs. If you take away all the excuses and domestic chores, then your wife or partner will be more likely to say yes when you suggest a ride. This could include helping more around the house so she has some free time, organising someone to mind the kids for a couple of hours or even hiring some domestic help like a cleaner. Encourage her to spend a bit of money getting kitted out so she feels good when she goes out on the bike. Don’t give her all your hand-me-down stuff like your old helmet and gloves and expect her to feel keen about riding a bike. That doesn’t mean you have to start with the most expensive kit and equipment. The same thing applies to the actual bike. If she’s not sure if she really wants to become a regular rider then it’s better to start on a cheaper bike or even a borrowed one. I started my riding on a bike that cost me about $1,500 and have since upgraded. Many of my friends started out on cheaper flat bar road bikes, hybrids and even mountain bikes and have all upgraded when they caught the cycling bug. For me, having a goal to train for, works well. So find a bike ride in your area that she can prepare for. Don’t make it too difficult and long. For example, in Sydney every October there’s a ride called the Spring Cycle which is 55 km long. It goes from North Sydney to Sydney Olympic Park and is a great introduction to riding. Ultimately, your partner has got to want to do it and has to decide for herself. Hopefully my few tips might get your there. Good luck. It is most important to ride with your partner and enjoy it as you enjoy the rides you do with your mates. Do special events with her / him, ride at her / his pace and make sure to make comments (and make yourself believe) that you found it enjoyable / useful in riding at that pace. Remember how long it took you to become how fast you are today.